We are pleased to recommend you, buying the voucher: "Invitation to a photo shoot," as a gift for a loved one or for yourself. Subject portrait session to choose from: portfolio, business, role (eg. The pin-up, modal), gestational, "eighties", family, Engagement, professional CV. As always happens with me, they support me a group of professionals. Makeup artist will take care of makeup and stylist watches over the selection of clothing. The atmosphere is nice and friendly, you feel special. 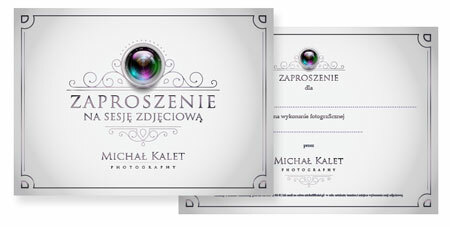 While the findings concerning the date and type of photo session, voucher in the form of an elegant roll the note (as pictured), in a decorative envelope will be sent to the indicated address - after payment (button below). You can also receive personally. - 3-5 hour session - studio or outdoor (to be determined). - Photos in the form of prints on photographic paper as well as downloads. Access to the studio, or selected in the outdoors is done on its own. Within 10 days of the session, you will receive one print of format 13x18 and as downloads in high resolution. Payment is guaranteed by a system of secure online payment service dotpay. Contractor session is Michael Kalet Advertising Agency Artmack, ul. Czereśniowa 1, Wiry. The value is expressed in Polish zloty and includes the VAT. After payment invoice will be issued. You can purchase different types of sessions (at a different price), for example. Wedding session. Then please contact us by telephone, to arrange and confirm the availability of the free term.